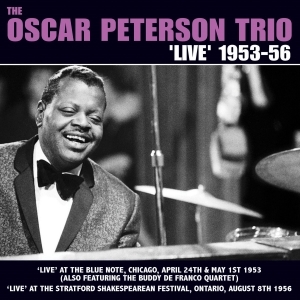 CD 1 Live at The Blue Note, Chicago (NBC Music For Moderns broadcast) April 24th 1953 & May 1st 1953; CD 2 Live at The Stratford Shakespearian Festival, Ontario August 8th 1956. Oscar Peterson ranks as one of the greatest jazz pianists of the post-war era, with a technique and style that was unique and highly distinctive, so it a pleasure to be able to make available these excellent ‘live’ recordings from performances during his heyday in the mid-50s. Both CDs, although the performances are three years apart, feature his classic Trio line-up of piano, bass and guitar, with Ray Brown on bass in both cases, with Barney Kessel playing guitar on the Chicago dates and Herb Ellis on the Ontario festival recordings. It is highly entertaining stuff, with Peterson in full creative flow, and the trio working in uninhibited fashion. Duke Ellington called Peterson “The maharajah of the keyboard” and Herbie Hancock, who cited him as a major influence, said “he redefined swing for modern jazz pianists ….and mastered the balance between technique, hard blues, grooving and tenderness”. These performances admirably illustrate that. As a bonus, the Chicago performances from the same concerts by The Buddy de Franco Quartet, led by the great clarinetist and featuring Art Blakey and Gene Wright, are included on CD 1.